Within Israeli society, a large debate has ensued about how to better integrate the Haredi (ultra-Orthodox) into Israel’s labor market and modern economy. To shed light on this issue, Taub Center researcher Eitan Regev explored trends in education and employment among the Haredim. Regev found a substantial decline in both high school and higher education rates among Haredim over time, with the older generation of Haredim more likely to have an academic degree than the younger generation. This is in marked contrast to growing rates of higher education among every other segment of Israeli society, including non-Haredi Jews, Muslims and Druze, and Christian Arab Israelis. Haredi education, particularly for men, is increasingly characterized by fewer years of formal education, with the number of Haredi men of prime working ages 35-54 having no more than a primary school education rising from under one-third to nearly half over the last decade alone. What do these declining educational qualifications mean for Haredim when it comes to their integration into Israeli economy? How does the decision to attend a small yeshiva starting after eighth grade, rather than continue with formal education, impact a Haredi boy’s prospects for future employment and his earnings potential? Regev’s research addresses both issues. Both Haredi men and women are much more likely to be employed if they hold an academic degree. 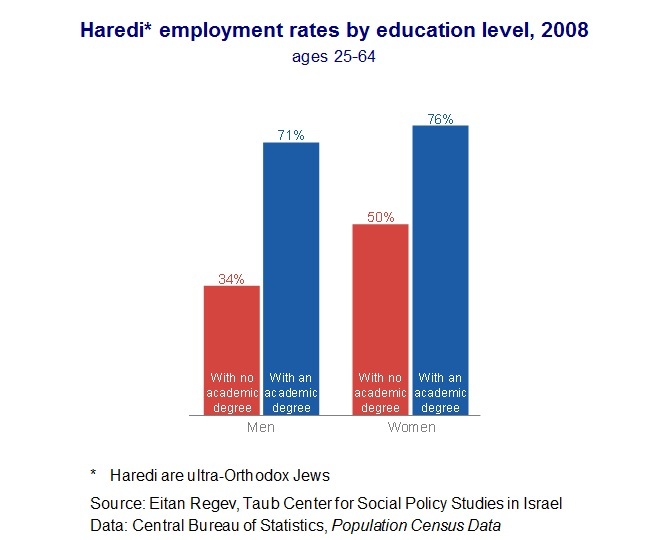 As shown in the first figure, while only about a third of Haredi men ages 25-64 without an academic degree are employed, the employment rate doubles to 71 percent for Haredi men with an academic degree. Such a gap, although smaller, also exists among Haredi women. While only half of Haredi women without an academic degree are employed, the figure jumps to 76 percent among those with an academic degree. Across various cities with large Haredi populations (Ashdod, Beit Shemesh, Beitar Illit, Bnei Brak, El’ad, Jerusalem, and Modi’in Illit,) large employment gaps exist between Haredim with a higher education and those without. Within Haredi society, it is common that women play the role of primary wage earner. Consequently, employment rates of Haredi women surpass those of men. Most Haredi girls receive a secondary education while the vast majority of Haredi boys continue in religious studies only – at the expense of any further formal education beyond primary school. As such, even among those without an academic degree in the Haredi community, women are likely to have a higher level of formal education than men and are thus better able to integrate into the labor market – with a 16 percentage-point employment advantage versus Haredi men. Among Haredim with an academic degree, the gap between the respective employment rates of men and women shrinks to five percentage points, in favor of women. The role of education transcends beyond the ability to find work, and has a substantial impact on types of jobs available to the individual and the compensation earned. As is common for other population groups, wages for Haredim with an academic degree are much higher than for those without. 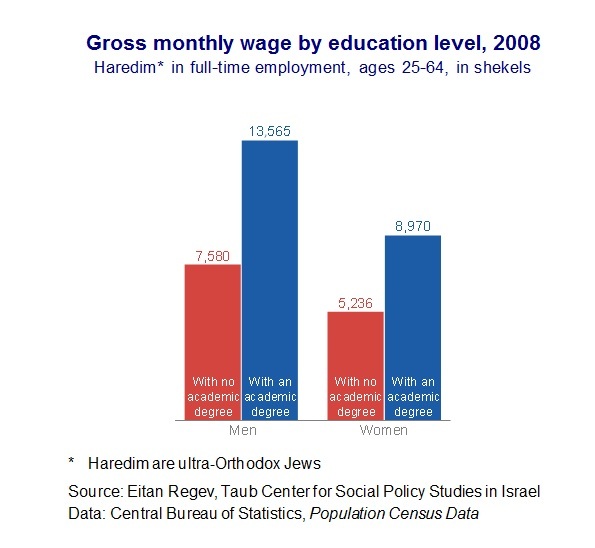 As shown in the second figure, among Haredi men ages 25-64 who are employed full-time, the average monthly wage of those with a higher education is about 80 percent greater than for those without an academic degree. Haredi women with higher education enjoy wages that are 71 percent higher than their less educated counterparts. Wage gaps between Haredim with and without an academic degree are evident across the cities with large Haredi populations, with the largest gaps evident in Bnei Brak (105 percent for men; 102 percent for women) and Beit Shemesh (100 percent for men; 81 percent for women). Not surprisingly, the wage and employment gaps between those with and without an academic degree have an impact on overall household income, which is affected by the education levels of both the husband and wife. In 80 percent of Haredi households, neither the wife nor husband has an academic degree. These households have income that is 62 percent lower than those in which only the wife has an academic degree and 88 percent lower than those in which only the husband has an academic degree. In only five percent of Haredi households, both the wife and husband have higher education – and such households enjoy income that is 157 percent higher than those households with no academic degree holders (18,943 NIS per month versus 7,382 NIS per month). Sufficient household income from labor is critical to help ensure a decent standard of living for large Haredi families and to prevent households from falling under the poverty line. Regev’s findings on the labor market impact of high school and higher education are important as they provide guidance on policies and programs to improve labor market outcomes and address the high poverty rates among the Haredim.